Don’t forget to click on a photo to enlarge it. 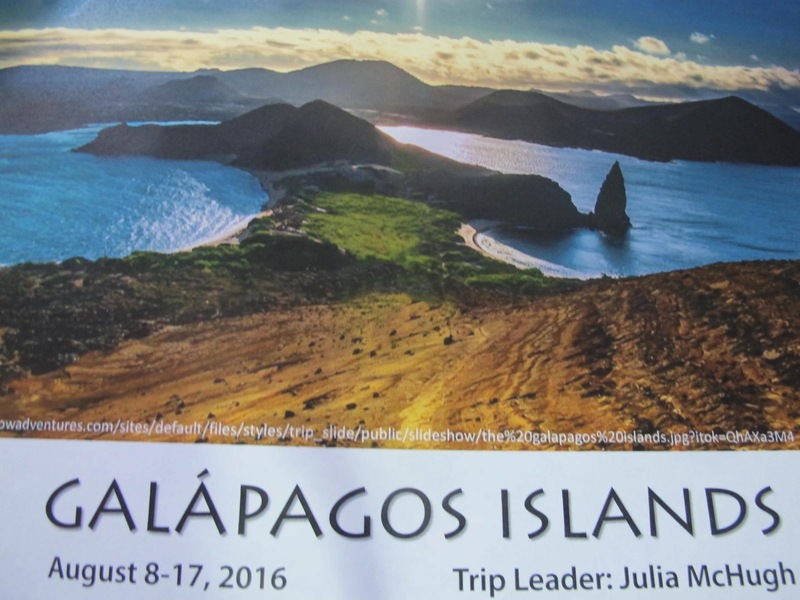 Way back in December, Shirley (a long time friend since the beginning of teaching days in 1967) called to see if I would like to go with her to the Galápagos Islands. Museums of Western Colorado would be the sponsor with whom we took a great trip last year, so we knew it would be well done. I hemmed and hawed because transportation for those 8 days would be by boat and I have a proclivity toward mal de mer. It didn’t take me long to figure that I could use the “Sea Bands” (wrist bands with an acupressure button that helps with seasickness) and Dramamine. So we signed up and began the preparation of getting various vaccinations, sending deposits, figuring out what to take and then anticipating the departure date. The excitement began to build and then all of a sudden, the date arrived! I flew to Grand Junction, CO to meet the group and we took off from there. Our route took us via Dallas/Ft. Worth and then to Quito, Ecuador. 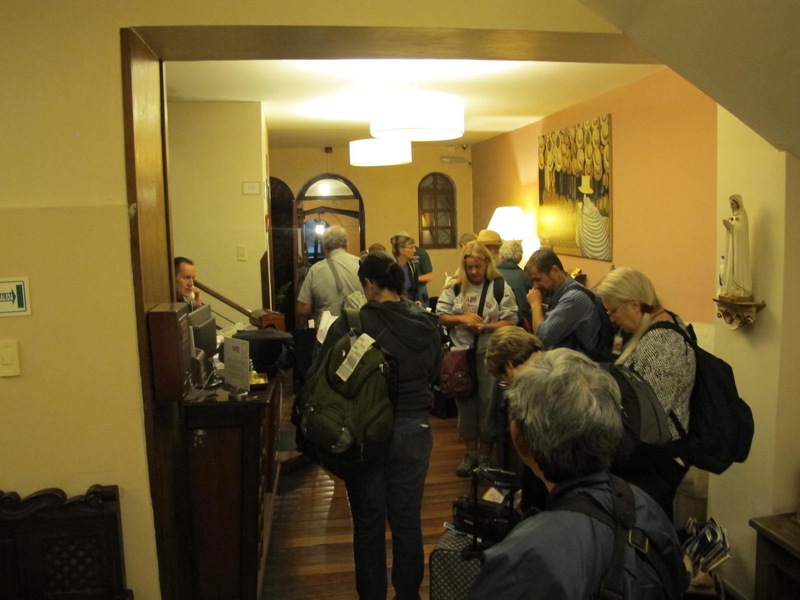 The bummer was that we arrived at our hotel about midnight and then had to leave at 3:45 AM! Yuck. 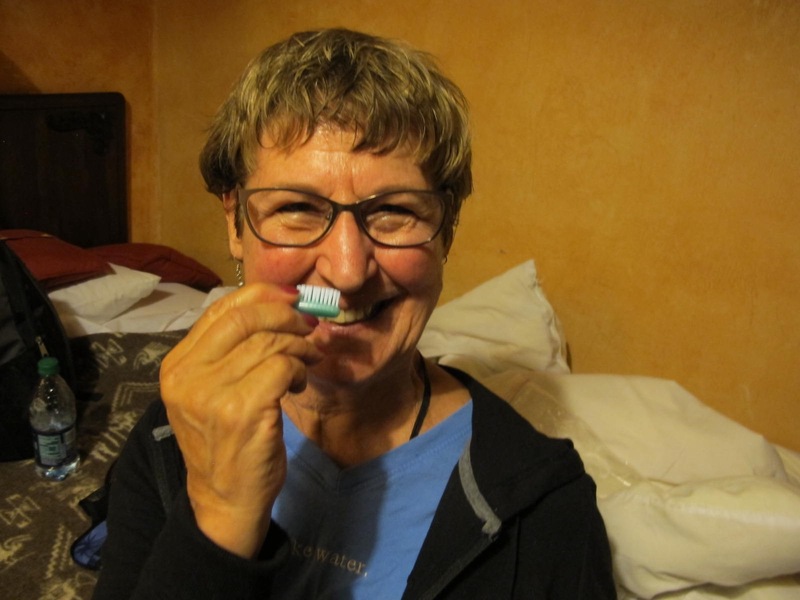 Shirley was still lucid enough to laugh when her new toothbrush broke during the first brush in the hotel. 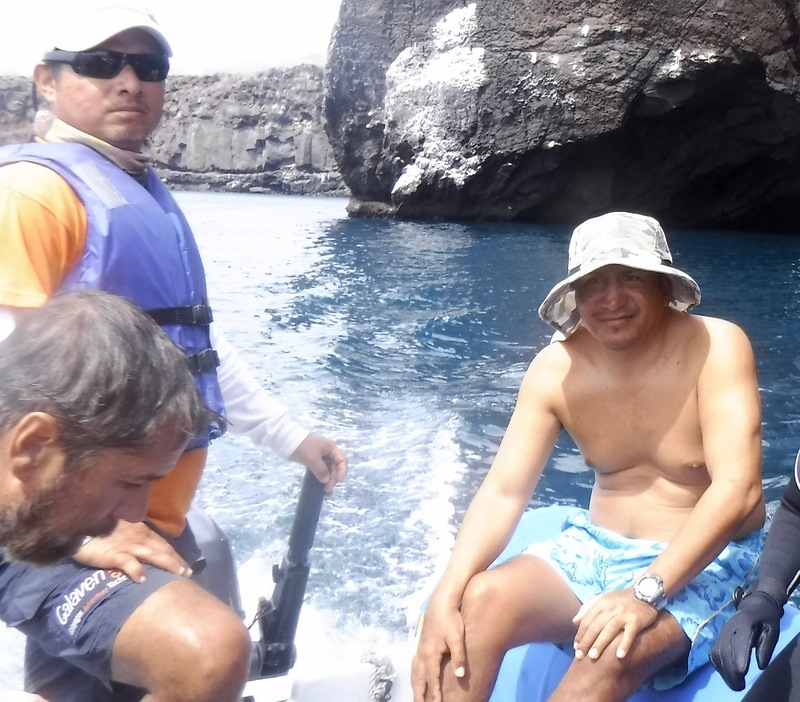 We finally arrived at the Baltra Island Airport in the Galápagos and were met by our two guides, Erick and Pato, who took us to our boat, the Galaven (Technically, it was a yacht). We had time to get situated in our cabins, eat lunch and rest a bit before we took our first excursion. This sea lion greeted us on the dock as we prepared to go to the boat. He sort of waved a flipper at us. This was our cabin. 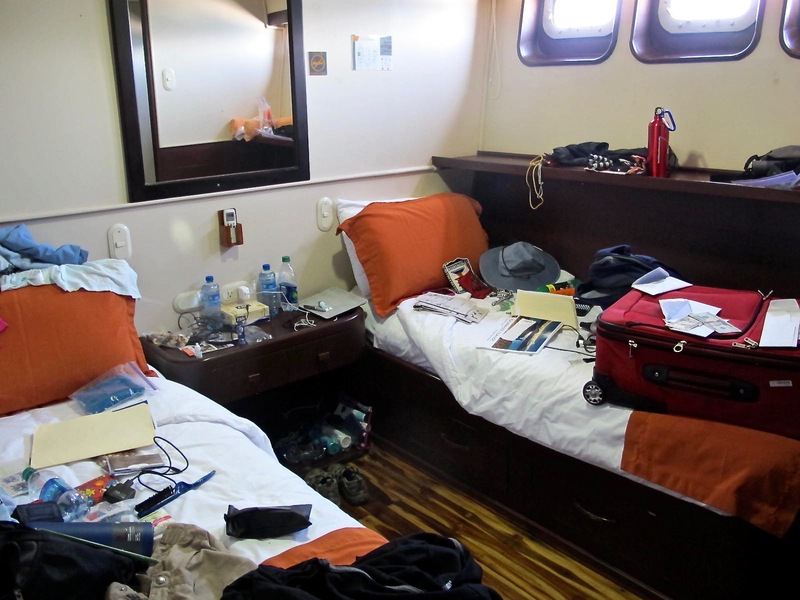 It really didn’t look this messy after we finished stowing our gear. I liked our little cabin as we had our own bathroom (“head” in ship lingo) and almost enough room to both be walking in it at the same time. The best part was that Shirley was smart enough to choose a lower cabin amid ship so as to lessen the rocking and rolling the people in the upper cabins experienced. I was grateful. 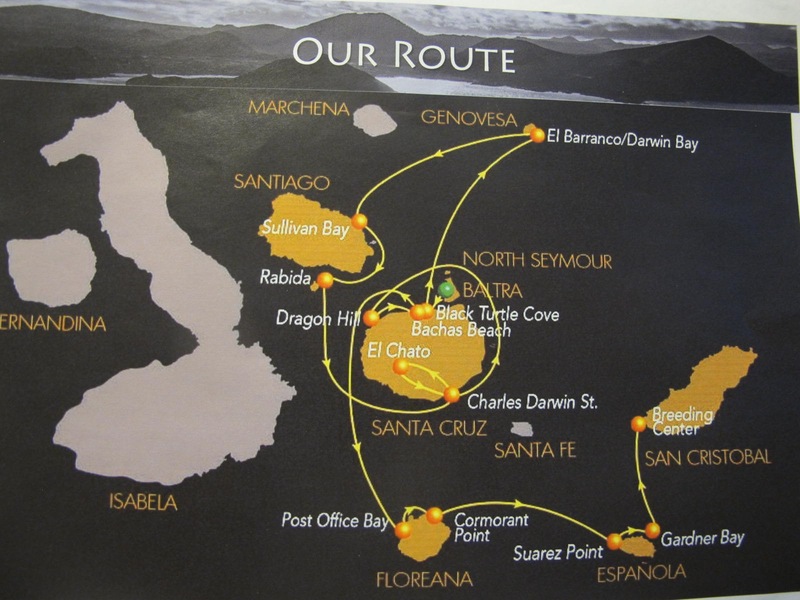 Before I get started on the adventure, I want to show you our route in the islands. 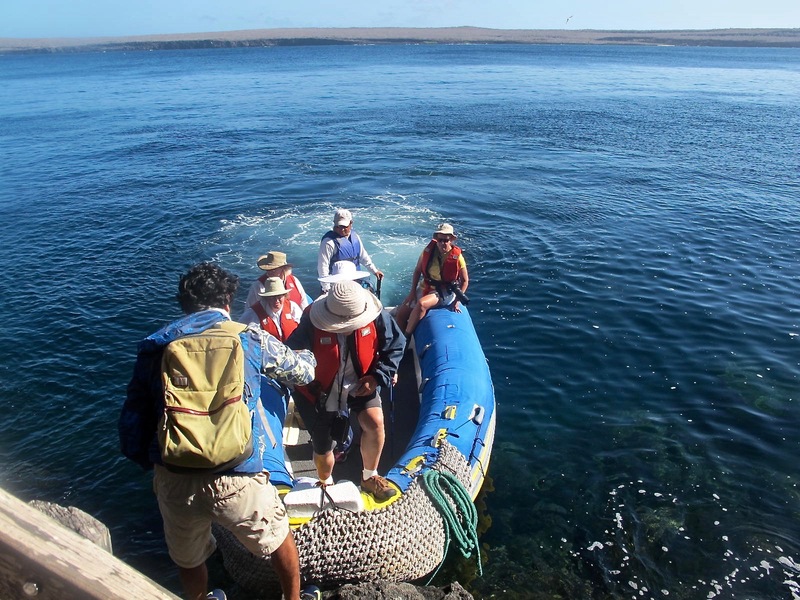 We landed in Baltra and departed from San Cristobal, landing on 8 islands altogether. 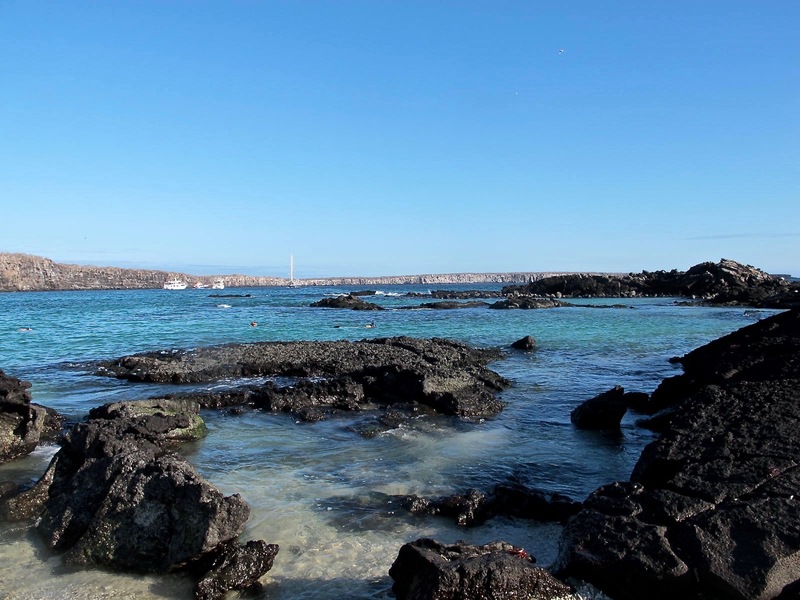 Baltra is a small island separated from Santa Cruz by only a narrow strait. 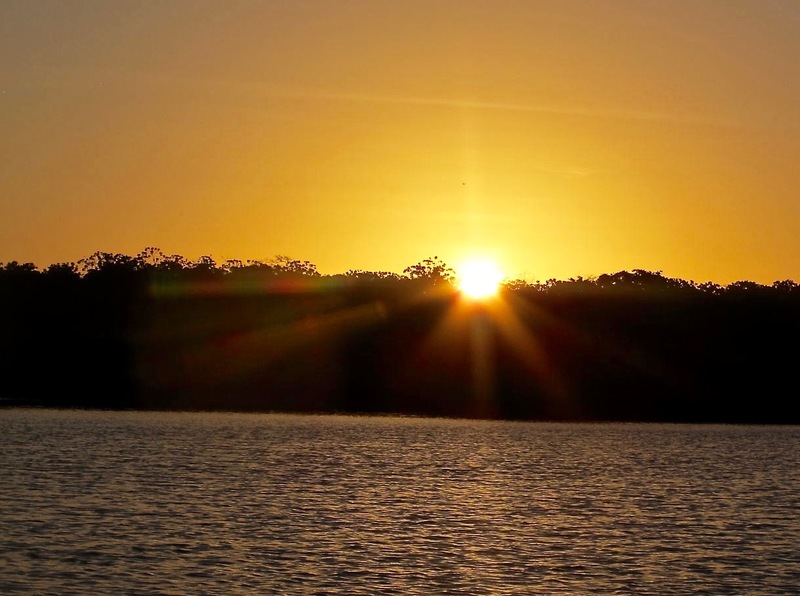 While we were getting settled in our cabins, our boat got underway and took us to Black Turtle Cove on Santa Cruz. 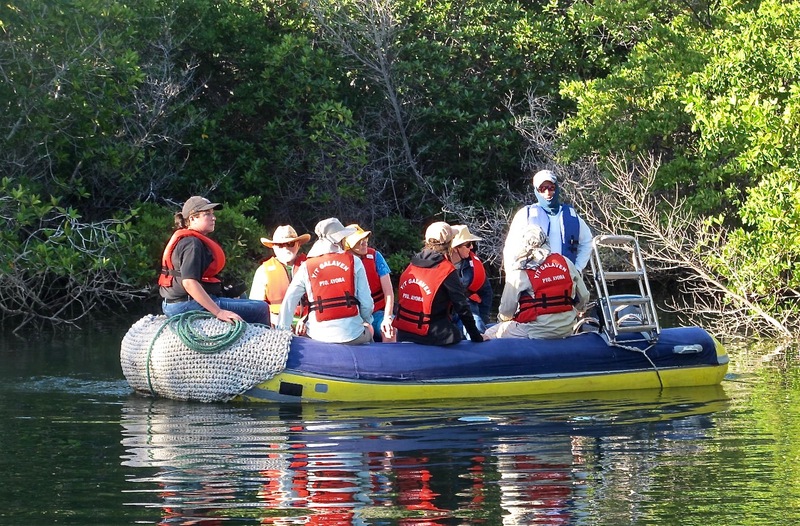 Our first excursion was a Zodiac ride to the cove that is an inlet surrounded by mangroves. This was great! It gave us all a taste of what we were going to see in future adventures. Oh my! The birds, the terrain, the flora and fauna were superb! We all began taking a zillion pictures as each turn led us to more things to see. 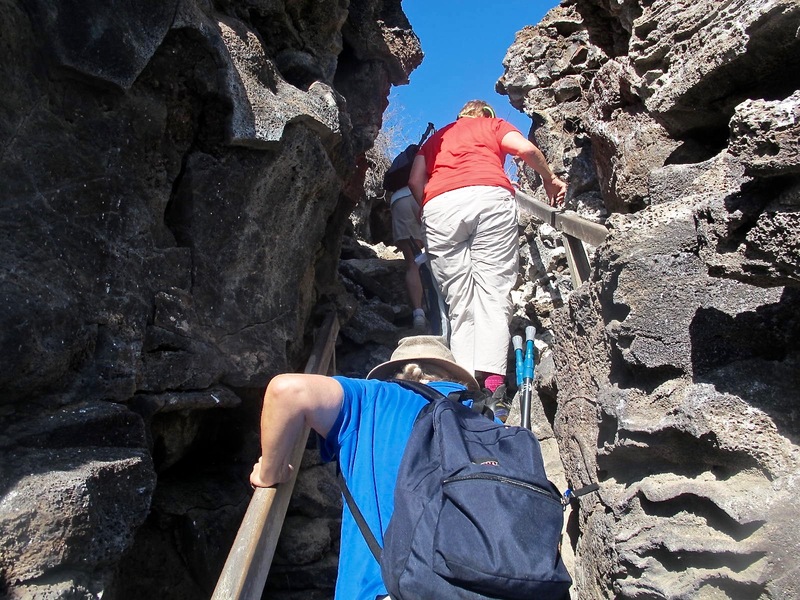 Our group consisted of 18 passengers, two guides and two boatmen. Erick and Pato were so good in explaining the whys and wherefores of how the islands came to be, the animals, the ecology, adaptations and so many facets of all we saw. I learned a bunch and I’m sure the other folks did too. Pato is in the swimming trunks on the Zodiac. He usually went in the water with us. 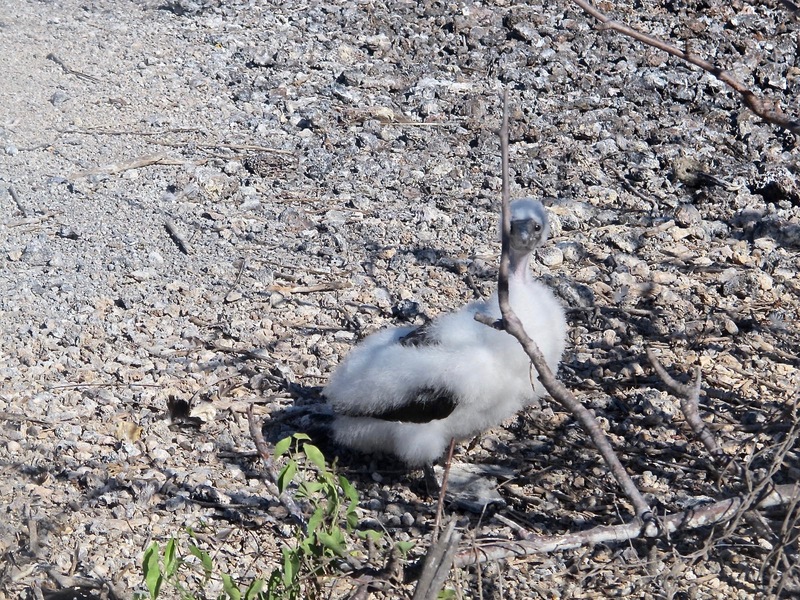 One of the first birds I saw was a blue-footed booby. I just about wore out my camera with those birds. I was so fascinated by their poses, antics and chicks. Among other animals I saw from the Zodiac were sea turtles, a small hammerhead shark, brown pelicans, brown noddies (birds), small white tipped sharks and a couple of spotted rays. My first Galápagos sunset was viewed from the Zodiac…different from those around the Sierra Nevadas, but it was beautiful. Back on board, we had our first daily briefing that always let us know the history/background of the next day’s island/activities and how to prepare for them. 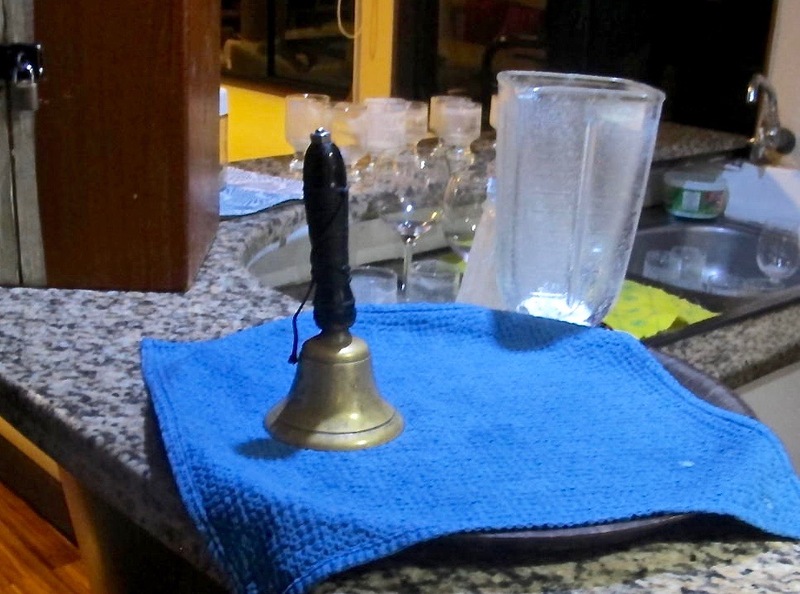 We also learned that we were summoned to all meals and activities by what looked like a small school marm’s bell. Perhaps most cruises use some sort of summoning devices. I don’t know about that because I’ve never been on a “regular” cruise. I thought the bell was fun. We all learned to anticipate it and be ready to do whatever the activity was. The first two meals aboard the Galaven told Shirley and me that we were going to be very well fed. After a couple of days of filling up my plate and being uncomfortable afterward, I finally had to cut way back on the intake and I felt a lot better. The food was good and I enjoyed it but I just can’t eat large anymore for more than a few meals. Bummer. After dinner, the Galaven began to move to Genovesa (Hen-o-vaysa), the northernmost island on our tour. While on Genovesa, we were in the northern hemisphere and then crossed the equator to return to the southern hemisphere again to go to Santiago, our next island. We were teasing each other about feeling a bump as we crossed. 🙂 Genovesa is where I spent my 72nd birthday…and it was like no other birthday. We motored alongside a cliff and saw more new species. 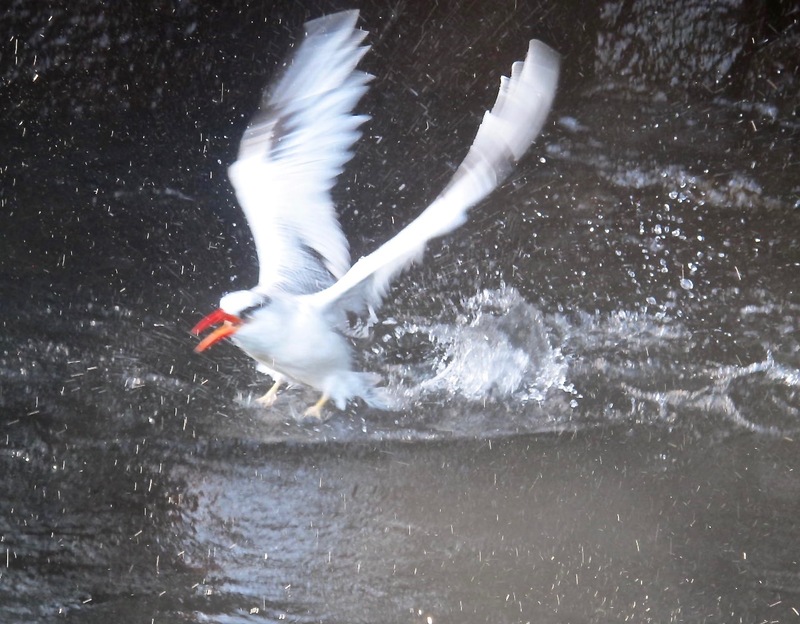 I heard a racket above me and saw two red-billed tropic birds in a fight. One was hanging on by a beak and then fell to the water. I think he was embarrassed as he took off in a huff from the water. 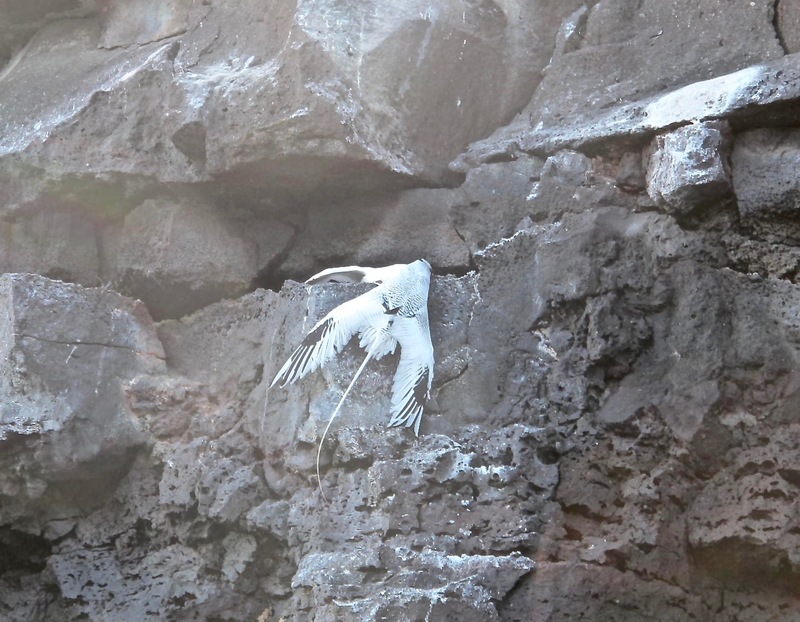 It’s easy ID a tropic bird because of the long, skinny tail feather. Hanging by a beak on a cliff. Note the long tail. We clambered up Prince Phillip’s Steps (apparently Prince Phillip was there and the steps were built for him. At this point, I should issue an apology because when I got to the top of those steps a whole new world opened up and my camera went crazy once again. There were birds everywhere! I took way too many pictures and each one seemed to be a better photo op than before. If you get bored with this type of stuff, you should quit reading now. I should also tell you that even though it is winter during August in the southern hemisphere, it is breeding season for many of the birds. Consequently, we got to see birds in all stages of life. It was an amazing experience for me. The first birds we saw at the top of the plateau were Nazca boobies. They have an elaborate dance during which they touch bills and the male offers the female a special twig or a rock. If she rejects him, she shakes her head vigorously. He might try again with another offering. They nest on bare ground and they are all over the place. The same chick flexing its wings to gain strength. 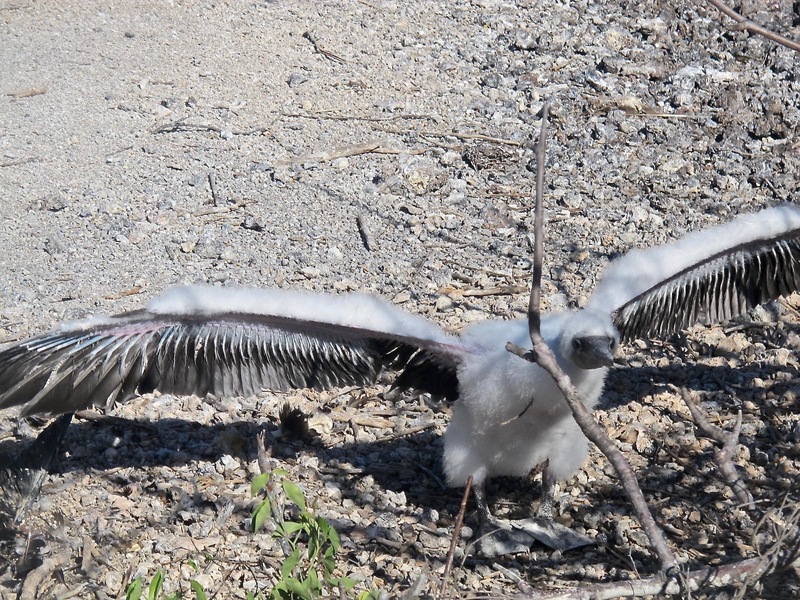 An adult’s wing span is about 5 feet. 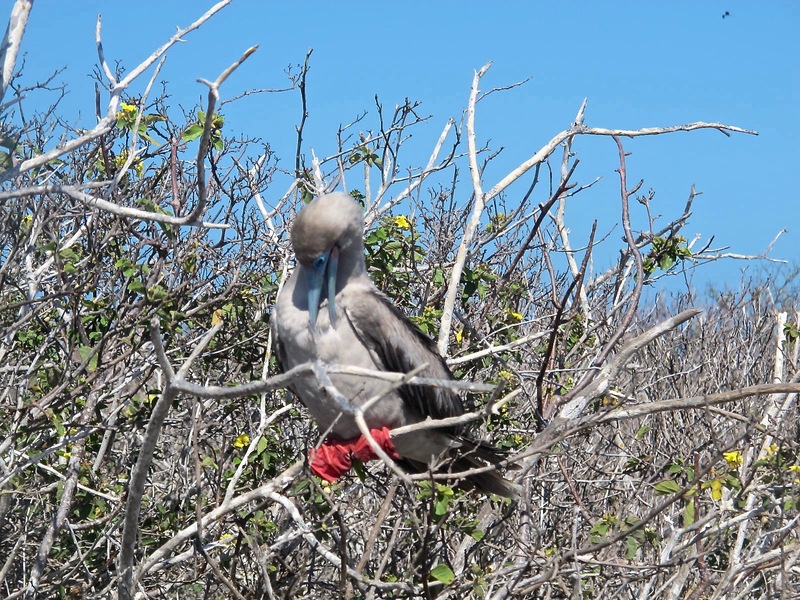 Genovesa is home to red-footed boobies which nest in trees as opposed to the ground as do the Nazca boobies. It seems that everyone has their niche and it works for them. You’ll note in this picture that their webbed feet can hang tightly to a tree branch, thus allowing them to perch. 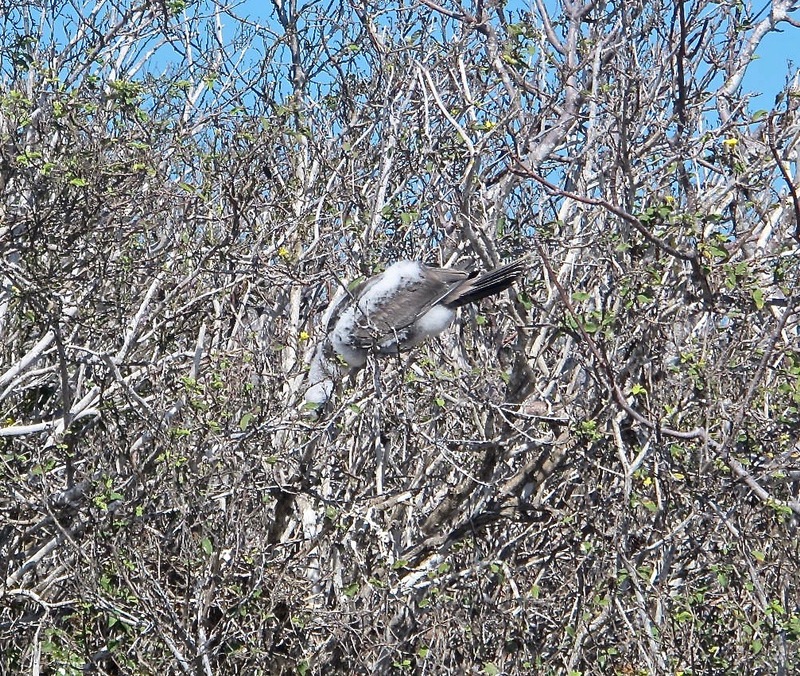 I saw a bird almost upside down in a tree and thought it was dead or drunk on some food that it ate.. It turns out that red-footed boobies fall into a very deep sleep and sometimes look like this. 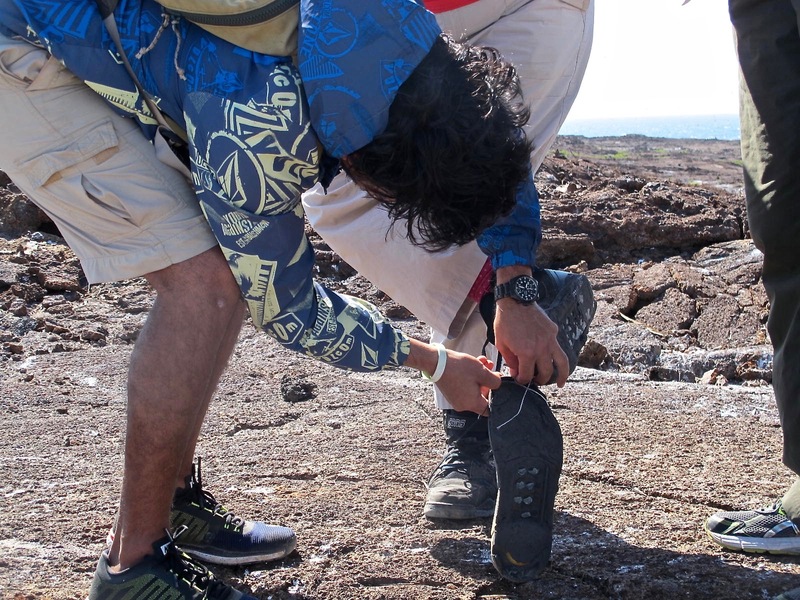 While we were walking over rocky path, one of our new friends, Lydia, had a flat tire… the sole of her shoe came undone and Erick helped her take the entire sole off the shoe. A few minutes later, the other one detached itself. I don’t know why this happened but it was cause for much laughter and teasing. 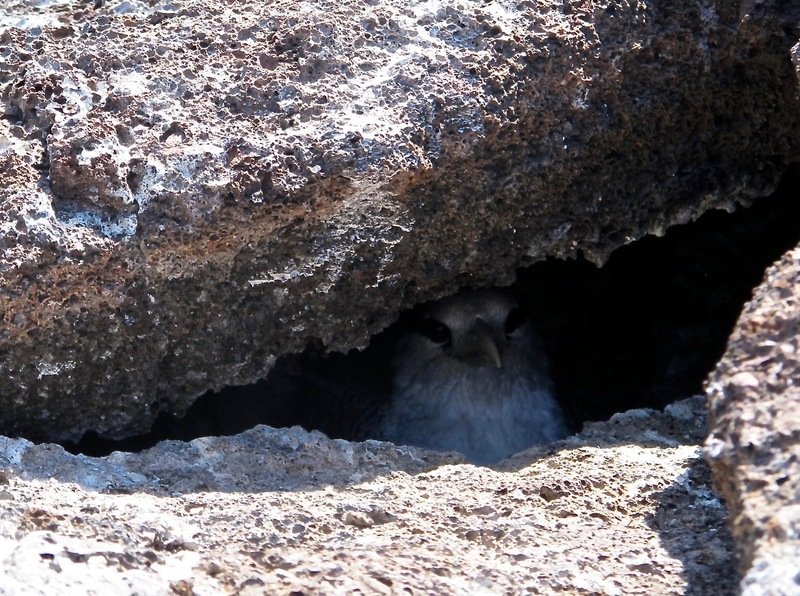 A tropic bird chick in a tiny cave. 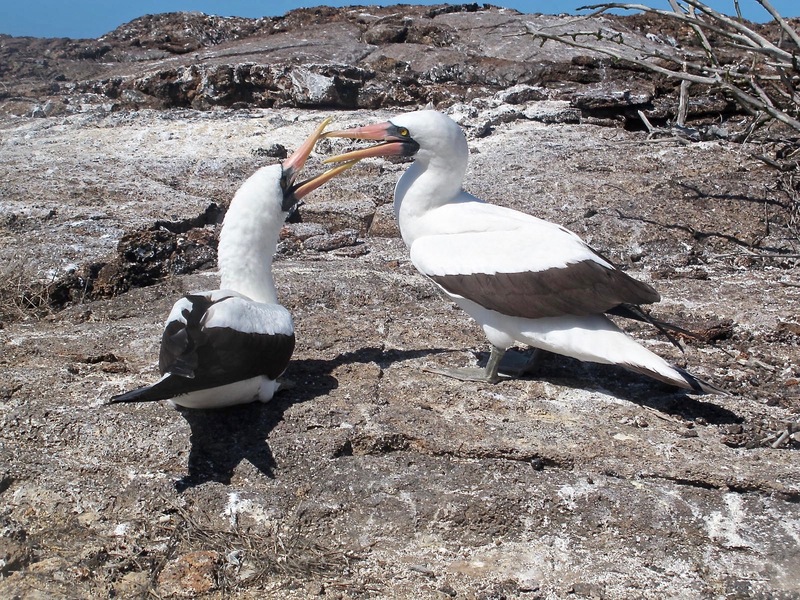 The plateau offered us a view of the Pacific Ocean and a host of many birds flying around looking for lunch. Storm petrels were all over the place, darting in many different directions. They reminded me of the swallows that come home to Capistrano every year with their type of flying. In fact, the Spanish name for these birds is “Golondrina de Mar,” swallow of the sea. They were always too far away to get a good picture. Rats. 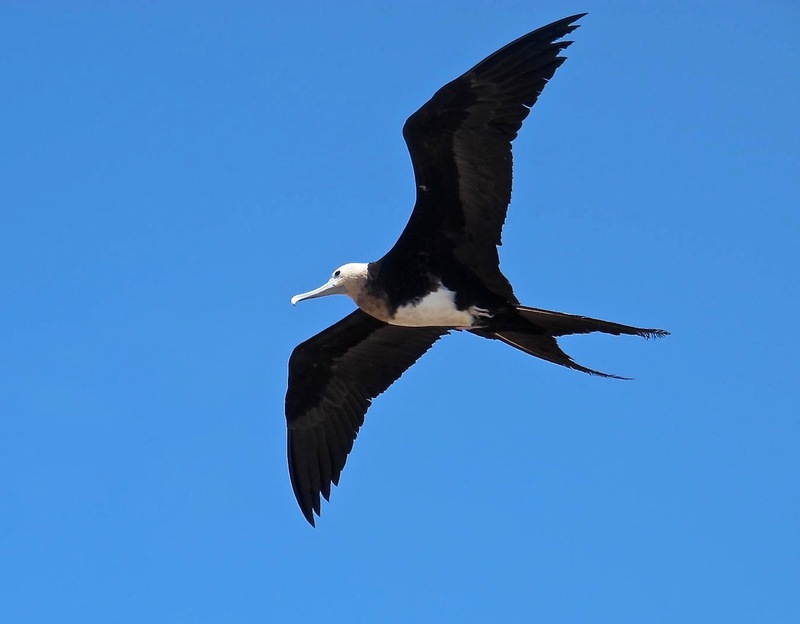 One species that often flew over us was Great Frigate bird. Their wingspan can be seven and a half feet! As we were beginning to descend Phillip’s Steps, Erick espied a wounded sea lion on some rocks right where we were to board the Zodiacs. 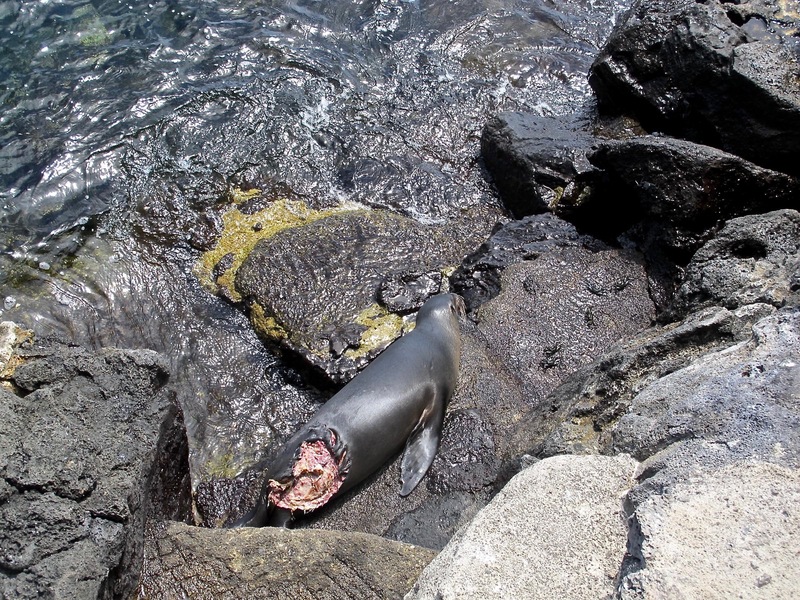 The poor thing had been bitten by a shark. Erick was pretty sure it would die but there was nothing we could do to help it. 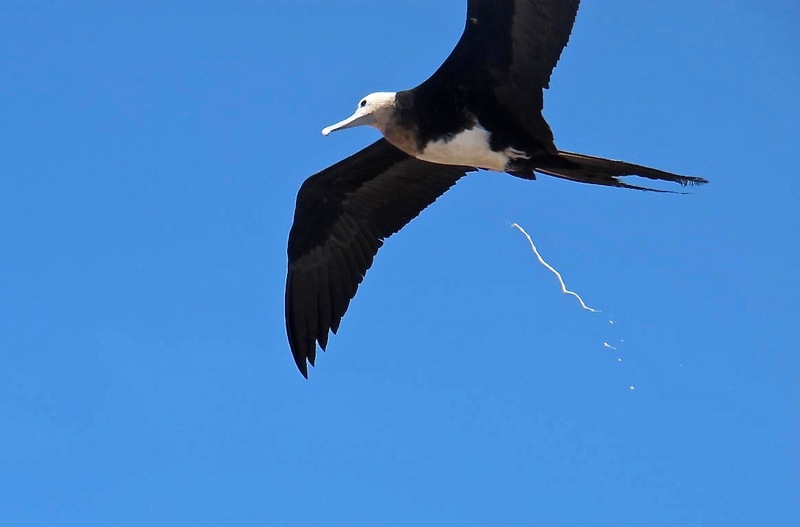 It’s pure nature in the Galápagos. But this story has a happy ending. About an hour later, many of us were snorkeling in the same area and that same sea lion swam by us as if nothing had happened! We were happy for that. 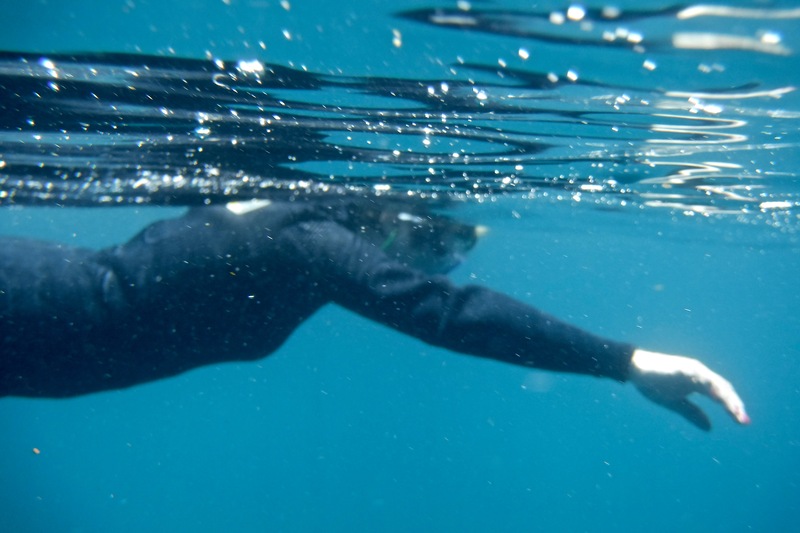 I was snorkeling with our tour leader, Julia, and got a big thrill. A large white tipped shark swam under us and was gone before I could get my camera ready to go. Rats. Genovesa is a horseshoe-shaped island that is a collapsed volcano with Darwin Bay comprising the collapsed side. 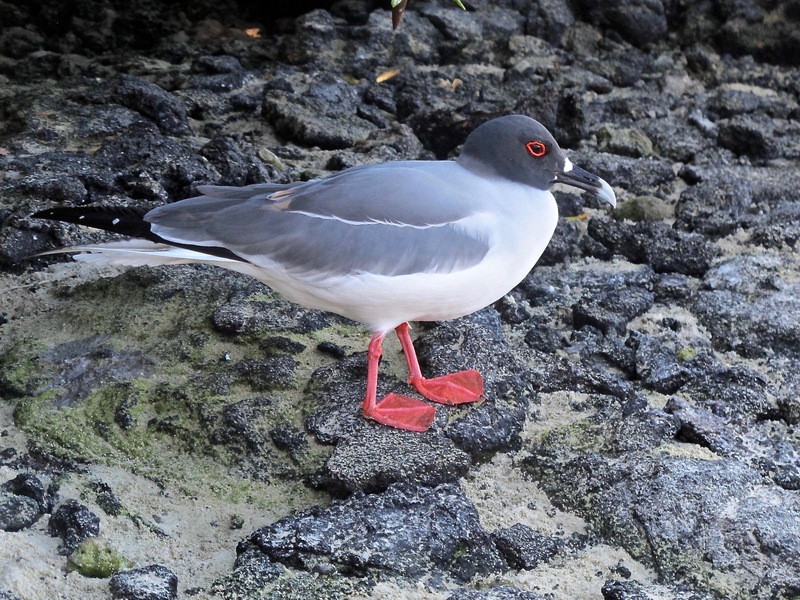 It has a white sand coral beach that heads a trail that winds through mangroves filled with many birds. This is where we went after lunch to hike and snorkel. We saw our first marine iguanas at Darwin Bay. I thought they would be a lot larger but the largest was about a yard long. They are kind of scary looking because of their dragon-like spikes on their back and sort of bashed in nasal feature. That feature is an adaptation to allow them to gnaw the algae off the rocks much closer. 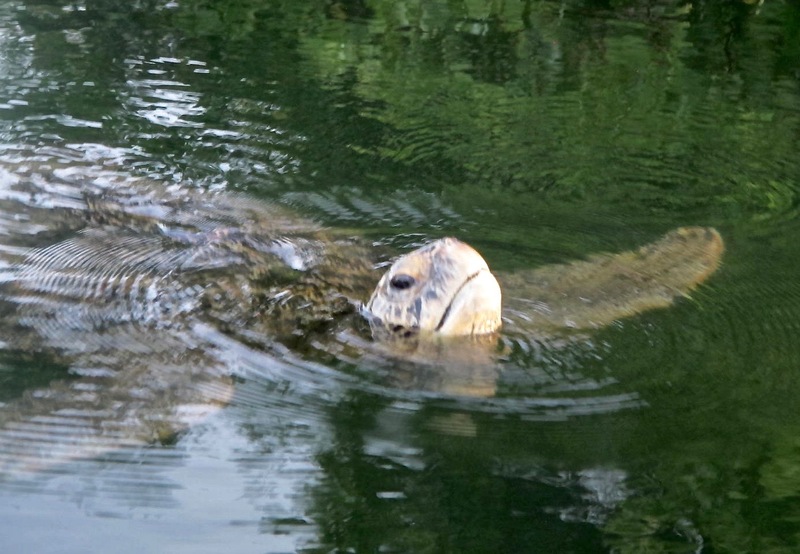 They spend hours each day getting warmed up enough to go swimming for food. Erick told me that in colder waters, they can only spend about 15 minutes per foraging session before they get too cold and can’t move well. 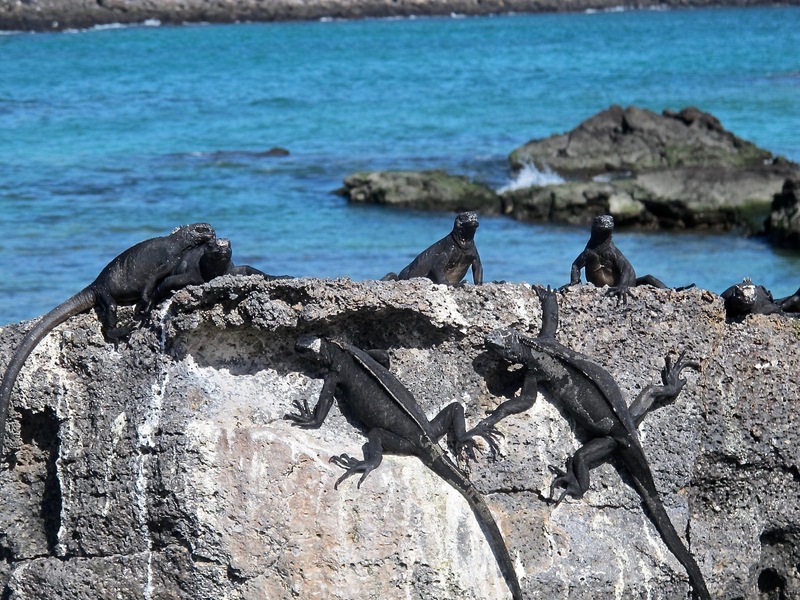 A group of marine iguanas on land is called a mess. Who knew? 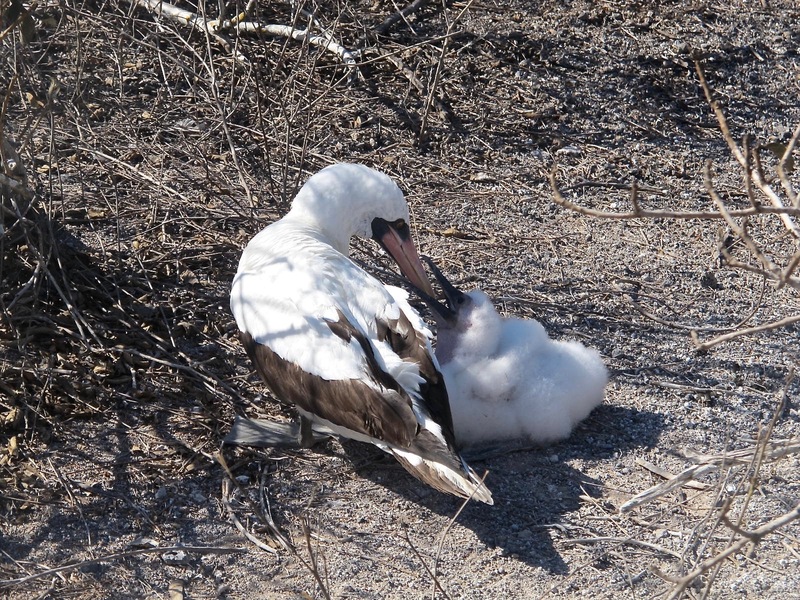 Frigates nest at Darwin Bay. 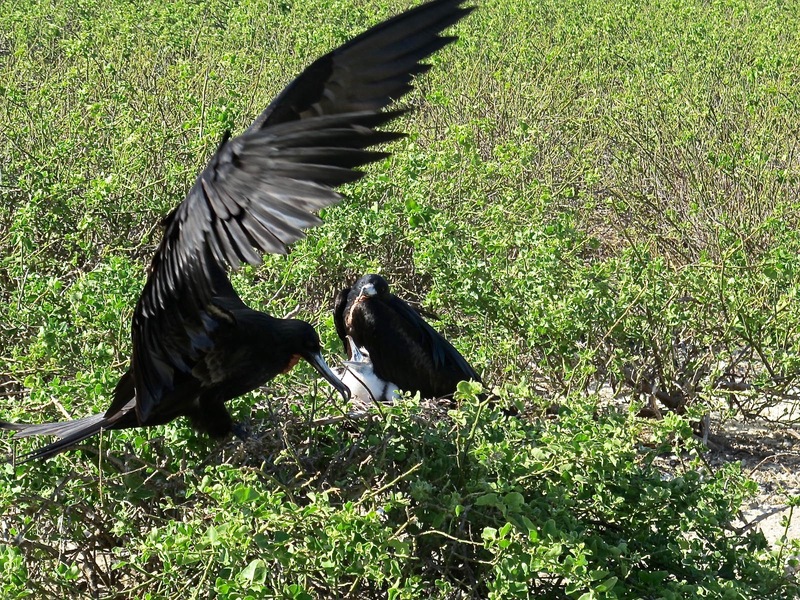 Here is a mama landing to feed her chick that the papa has been guarding. 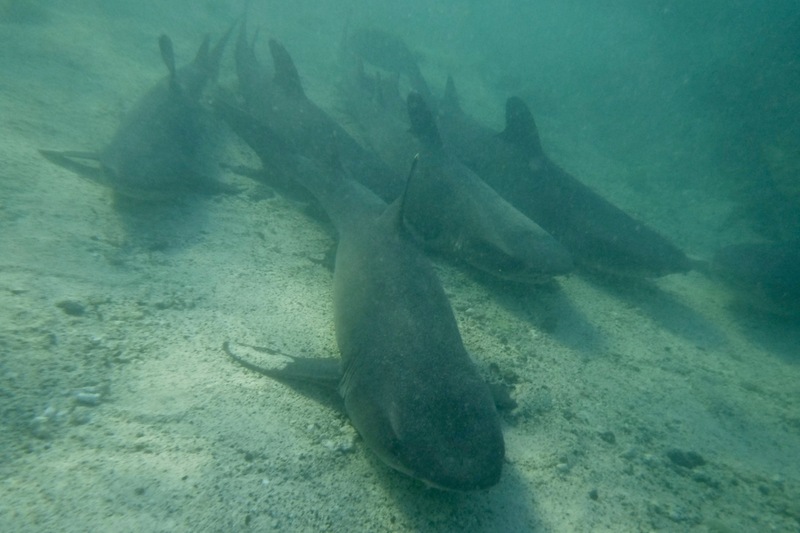 I decided to go snorkeling after our hike and discovered this family of white-tipped sharks in about 4’ of water. My heart beat a bit faster when I first saw them, but they didn’t seem to be hungry or interested in me, so I just swam around them taking pictures. It’s kinda cool to say you swam with sharks if you don’t tell people they were rather lethargic. Darwin Bay was a pretty place and perhaps the warmest place we swam. 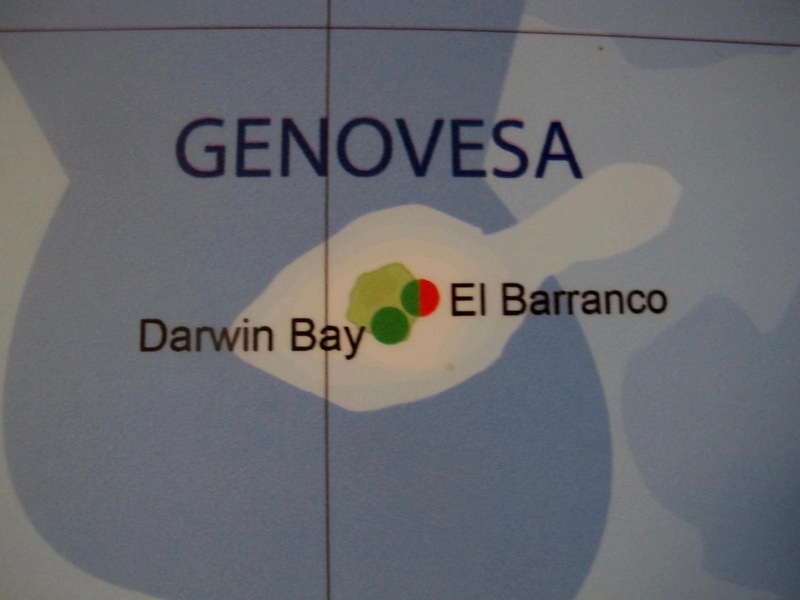 I enjoyed Genovesa and wished that I had snorkeled more in Darwin Bay. I think I might have seen more fish and perhaps some different species. It’s hard to tell. 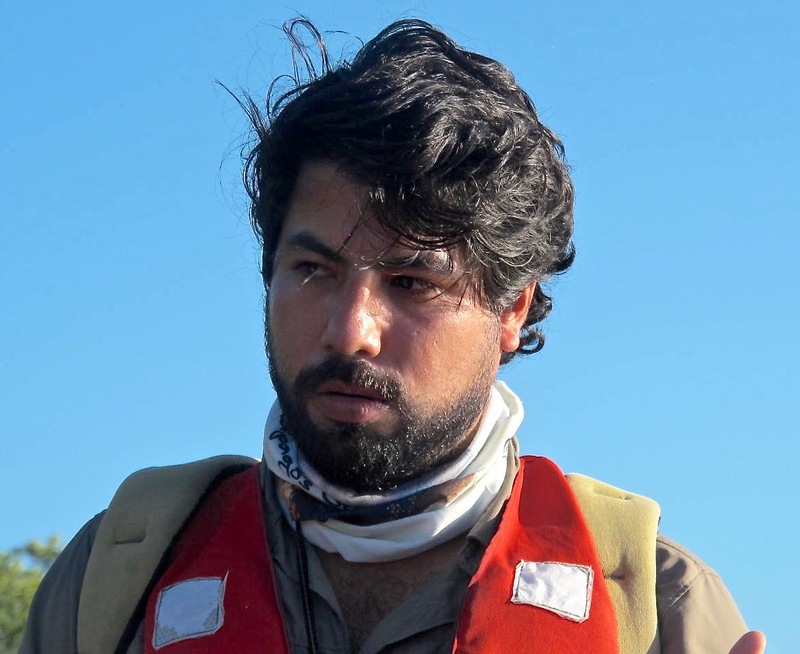 We sailed from Genovesa after dinner toward Santiago during what I thought were rough seas. I was very thankful for the Sea Bands. They worked that night! Thus ended the first two days of our trip. The following days promised to be just as much fun. Cora, in a word: SPEC-tac-ular! Great job all around, photos and narration. I am envious of all the Nature you witnessed, above and below water. More! 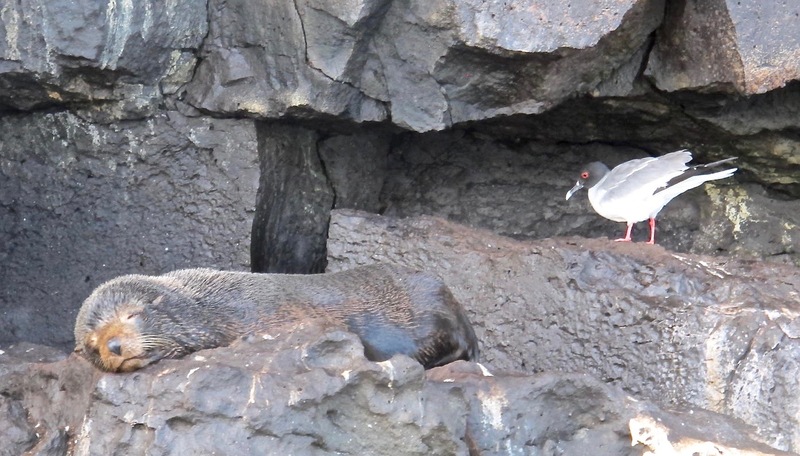 I look forward to additional BuzzardNotes blogs from your trip, Galloping Galápagos Girl! I don’t think I’ve written to say how much I enjoy your blog. 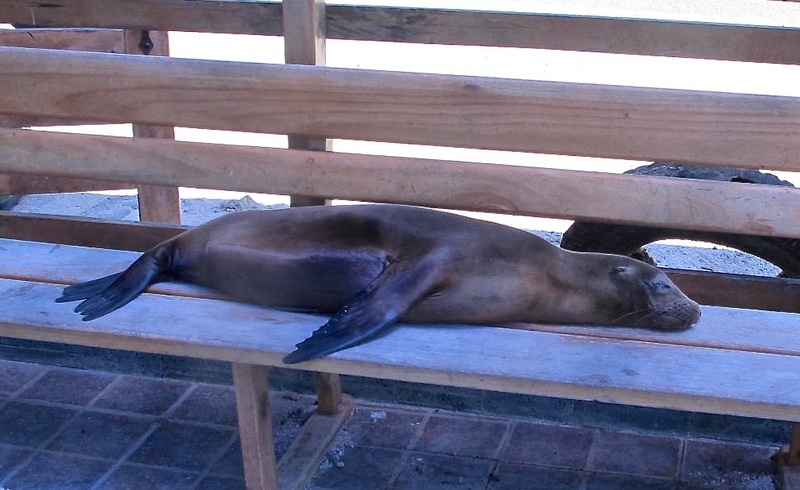 Your Galapagos excursion made it impossible to keep the joy to myself any longer. Suffice if to say…I love your blog. You are are terrific writer and always make me feel warm and fuzzy towards you and whatever you share of your exciting and very adventurous life. Girl you go! Love it. I look forward to your entry! And RIP kitty. She was beautiful…and I am familiar with the joy, thrills, hilarity, and the muse of a fuzzy friend/family member. Cora, what a trip of a lifetime!! 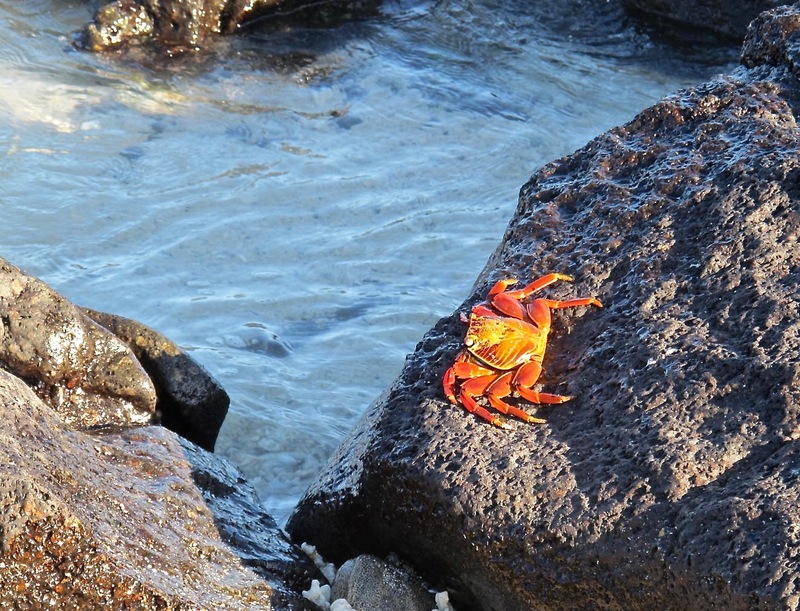 So thrilled to read about your latest expedition and see all the beautiful pics! No one is more deserving of such a wonderful and beautiful trip! Happy Belated Birthday!! Cora, in a word: SPEC-tac-ular! Great job all around, photos and narration. I am envious of all the Nature you witnessed, above and below water. More! 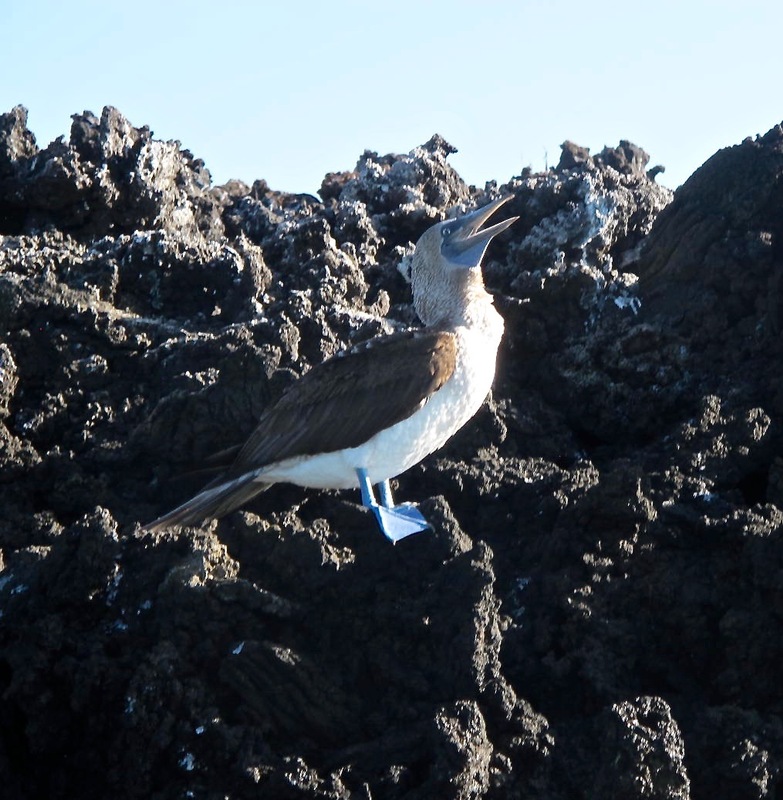 I look forward to additional BuzzardNotes blogs from your trip, you Galloping Galápagos Girl! You are a treasure. Much love and multiple hugs. That was a birthday celebration that will be hard to beat! What a fabulous trip and such a fascinating part of the world. Happy Belated Birthday, and may you continue to enjoy many adventures yet to come.